We have spaces for over 150 cars at the ground. Parking is free of charge. Our nearest station is Northwich, with trains to/from Manchester, Chester and Crewe. 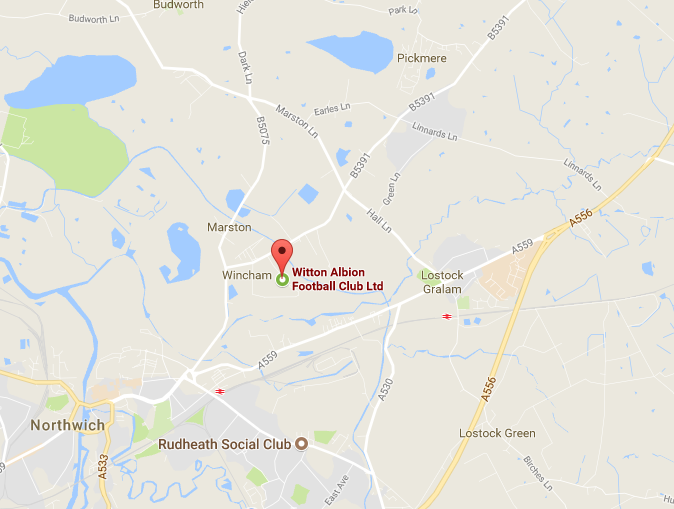 The ground is located just a mile from the centre of Northwich, a 5 minute cab ride or 20 minutes’ walk from Northwich station. From M56 Junction 10 - Follow the A559 (Northwich Road) towards Northwich for approximately 6 miles. Turn right at the crossroads traffic lights by the old Black Greyhound Public House (signposted). Follow the road through the industrial estate for about ½ mile. Turn left immediately after crossing the canal bridge (signposted).